Kyle McFarland. Lawrence Journal World. 1. Lawrence and Free State quarterbacks Brad Strauss and Kyle McFarland, respectively, become the fifth and sixth quarterbacks of the last 10 years to accumulate over 1,000 yards passing and rushing in the same season. 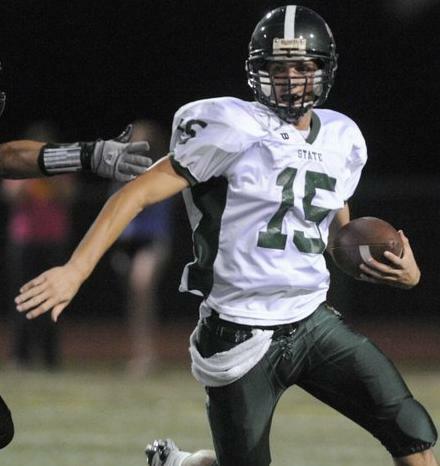 They will join Free State quarterbacks Ryan Murphy, Camren Torneden, Dylan Perry and Olathe North great Dustin Moomau on the list of quarterbacks from the Sunflower League to do so over that time period. 2. There will be movement out of the Sunflower League cellar. As in, this won't be your older brother's SM South and Leavenworth. 3. Gene Wier's Olathe North ballclub won't win a league title for the first time in his last nine seasons as head coach of the program (Olathe North won SL titles from '95 through '02, the last eight seasons Wier spent at the school before heading to Texas). 4. This will be the proverbial "Year of the Quarterback" in the Sunflower League, with headliners such as Jordan Darling, Frank Seurer, John Blazevic, Strauss and McFarland leading the charges of their respective offenses. At least one of those players will find themselves among the Simone finalists in December. 5. Lawrence will win 10 or more games for the first time since 2005 and Olathe East will add their 13th consecutive winning season and 11th consecutive playoff berth. 6. The winner of the colossal week five Olathe South vs. Lawrence matchup will finish the regular season undefeated and claim the Sunflower League crown outright. 7. Olathe South's Braden Smith will garner scholarship offers from the rest of the "Who's Who" of college football powers within the next six months, including Alabama who is close to offering but hasn't yet pulled the trigger. SM West's Austin Chambers will also see his offer list grow and at least one other player in the league who does not currently have an FBS will receive one. 8. There will be at least four players on my post-season Elite Eleven team that I did not do a Player Spotlight on and that may or may not have been mentioned, in an capacity, to this point in time on the Sunflower League Football Blog. 9. Some time around week six I will get slightly tired of blogging five or six times a week and struggle to get all of my posts up on time and people will get to work and see I haven't posted and email me with innocuous comments like "Are we getting stats this week?" or "I haven't seen the new Power Rankings, when should I expect those?" And I will receive at least ONE not so innocuous email from at least ONE not so innocuous parent/patron/"kid who goes to his high school football team's games to 'be seen' and hit on girls and make resoundingly shallow masculine statements common of male high school students of that age who go to games to 'be seen'"/grandparent/creepy uncle about how I am not writing enough about their team, our about how deeply, personally unfair it is that I spelled so-and-so's name wrong or about how I "really have no idea what I'm doing or writing about, do I?" 10. I will enjoy writing about the Sunflower League in 2012. Thoroughly.